It’s been over a month since I pulled back on Instagram posting. And while I’ve been away, I’ve been feasting on feedback and gorging myself on inspiration in a new town. Apart from pushing my posts here, the G+ monthly challenge, joining in the Raptor Pack day and #brickstameet, I haven’t posted any photos that weren’t either in support of an event or to promote another platform. Instead I’ve focussed on the blog and the G+ Toy Photographers community. And whilst on this self-imposed sabbatical, it’s dawned on me what I’d been craving. I‘ve been missing a sense of belonging, meaningful rapport, a sense of community. This is what I find in the G+ community; the clue’s in the title! Don’t get me wrong; I love seeing wonderful toy photographs. I love getting lost in their stories and the magic behind their creation. But I want more than just that. I want rapport. Being inspired by toy photography is one thing. Being motivated and encouraged by meaningful feedback and comments is another. I’ve written about the numbers game that Instagram revolves around before. It’s just that, numbers. I’ve also written about opening a thesaurus of words to aspire to. Maybe some of those words can also be used to inspire others by comments and feedback? Since my voluntary time-out from Instagram, I’ve stepped away from the ‘vanity over passion’ numbers game and into the G+ world with its wonderful members and refreshing rapport. Instagram’s algorithm might have put a dent in my numbers. Posting only weekly has, I assume, pushed my posts further down feeds, resulting in likes and comments taking a nosedive by 50%, or more. That’s cool. My numbers took a drastic hit when I decided to move my attention to G+, from 30k to 100, from 1000 to 20. But, as I’ve said, numbers aren’t why I do this. With significantly fewer followers, the evocative, heartening, helpful comments and feedback have multiplied. There really is a sense of community, a small town community. It’s our little town, where everyone knows each other and looks out for one another. There’s no need to lock your doors in G+ town! Feedback is another thing I craved when I stepped away from Instagram, and I’ve gorged myself on it over at G+. I’m as full as a boot, and it’s delightful! Do people’s comments and feedback inspire you? Have you joined our G+ community? I’ve been lacking the energy to invest in social media in general recently, which means I’m neither receiving or giving feedback, but when I come back, I fully intend to head back over to G+ as the community feels so much nicer and the engagement is so much stronger. There really is a nice feel to the G+ community isn’t there? Dare I say it, it kinda feels like IG in the early days. Oh, and the engagement is super encouraging, supportive and a wonderful source of motivation! We’d love to see you back in the community Lizzi. Great call Brett. On top of the reasons you have stated, I love the opportunity to talk about toys and pop culture in general. Sometimes the comment feeds go meandering off the path of the original post, and I find that fun. Exactly! There’s a whole raft of reasons why it’s such a great place to be. The meandering conversations are another one of those reasons. I’ve also been taken by the welcomes for new members the past few days. It’s like folks dropping off a casserole to new neighbours on moving day! Count me among those nodding in agreement with you, Brett. The loss of “community” over at Flickr was why I originally left there; I’m too much of a noob on IG for the algorithm to even hurt, but the gaping community void there is obvious. It can be fun and inspiring at times, but the G+ group feels totally different. There’s support, encouragement, conversation, answers… It’s like the difference between stepping into a social club vs joining a mass street protest. My repeat thank you to the monitors for building and sponsoring that space! There’s been a definite lack of social in the social media elsewhere. Maybe it comes with the sheer volume of numbers? Maybe it’s hard to engage in meaningful conversations when there’s so many to talk to? I dunno? The G+ community is that, a community. But it’s so much more! Great post as always, Brett! I absolutely love the accompanying photo. I too find myself getting way more inspired by actual interaction with other toy photographers than just simply viewing their work, which used to not be the case. I think it’s a testament to how great this community really is! I’m so proud and honored to be part of it. I think that’s the big thing that’s missing from platforms like Flickr or IG. Not only is it all a numbers game, but there’s not really a great way to interact with each other. I know that Flickr has groups, but they’re clunky and not easy to find. And with IG’s algorithm, it’s nearly impossible to follow along cohesively, let alone interact like we can with G+. Thanks James. 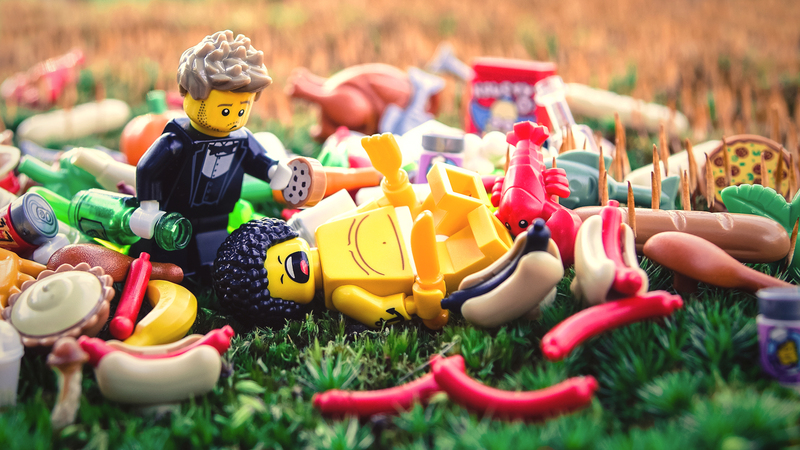 It always fun when I get to pull out the LEGO food for a photo! I couldn’t agree more with what you say. For me, IG had become stagnate. Despite folks posting some amazing photos, the interactions had waned. Beautiful photos alone, just weren’t dong it for me…I wanted more. And I’ve found it over on G+. Not that I’ve ever placed much importance on numbers, but when a post on G+ gets 4 times the comments than the +1’s, and majority of those comments are noteworthy or part of an engaging conversation, I’ll take those numbers any day! Yay! Yes, do give it a go Stacy. It takes a little bit to get used to, like anything new, but once you’re comfortable with it, it a great place to hangout, share and be inspired!